Taipei, Taiwan (May 26, 2017) – ATEN International, the world-leading provider of IT connectivity and total management solutions, announced today that its VM3200 Modular Matrix Switch and CS1924 4-Port USB 3.0 4K DisplayPort KVMP™ Switch have both been selected as winners of 2017 COMPUTEX Best Choice Awards, with the VM3200 taking away this year’s only award in the Digital Entertainment category. The BC Awards were established in 2002 to help overseas buyers find the most outstanding ICT products in a one-stop platform. This year, a total of 324 products were entered and judged on the basis of three indicators, those being unique features, innovation, and market potential. 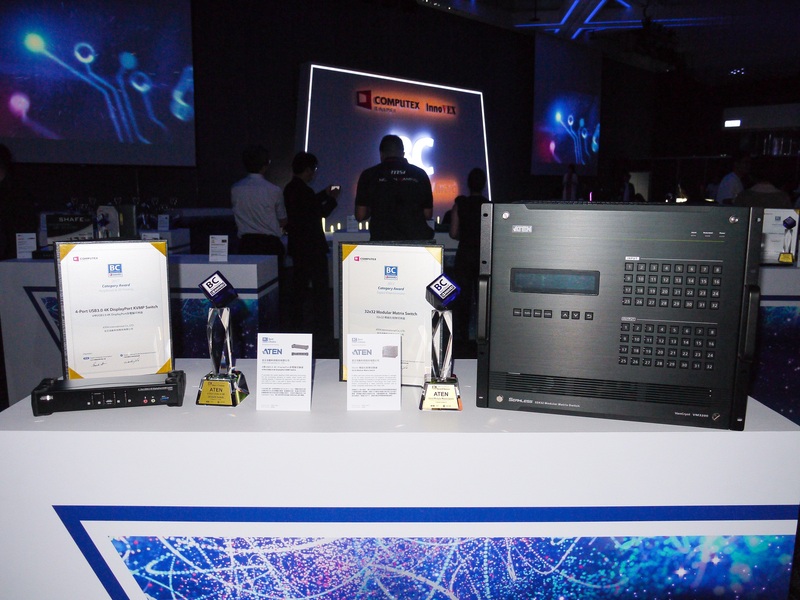 Only 35 products are selected for the award, which is seen as a benchmark for the best quality and most attention-grabbing solutions at COMPUTEX. The ATEN CS1924 4-Port USB 3.0 4K DisplayPort KVMP™ Switch provides the latest innovations in desktop KVM switching technology for the increasing demand of higher video quality and transfer speeds on modern computers. The ATEN CS1924 offers an unprecedented performance of delivering 4K resolution, the next generation USB 3.1 Gen 1 hub with SuperSpeed 5 Gbps data transfer rates and enhanced user-friendly operations. With its rich feature set, the CS1924 is designed to surpass all requirements in graphic design, animation, and video-editing applications. Such as CAD/CAM (computer aided design/manufacturing). The CS1924 allows you to share the audio from each of the connected computers. HD audio transmitted by DisplayPort would offer you a different experience. For more product information, please visit the VM3200 and CS1924’s product pages. ATEN International Co., Ltd. (TWSE: 6277), established in 1979, is the leading provider of IT connectivity and management solutions. Offering integrated KVM, Professional Audiovisual, and Intelligent Power solutions, ATEN products connect, manage, and optimize electronics in corporate, government, industrial, educational, and retail environments. ATEN has 500+ issued international patents and a global R&D team that produces a constant stream of innovative solutions, resulting in a comprehensive portfolio of products available worldwide. Headquartered in Taiwan, ATEN International Co., Ltd. has grown to include subsidiaries in China, Japan, Korea, Belgium, Australia, the U.S., the U.K., Russia, and Turkey – with R&D centers in Taiwan, China, and Canada.